We have found 5116 records with your search parameters. Only the first 200 records will be displayed. Please restrict your search further! Talk: 7th International Symposium on Visual Computing 2011, Las Vegas; 2011; in: "ISVC 2011", (2011), 12 pages. Talk: Meeting of the Electrochemical Society (ECS), Montreal, Canada; 05-01-2011 - 05-06-2011; in: "Meeting Abstracts", ECS, MA2011-01(23): 1453 (2011), 1. Talk: 6th Plymouth e-Learning Conference: Digital futures: learning in a connected world, Plymouth, UK; 04-06-2011 - 04-08-2011; in: "Proceedings of 6th Plymouth e-Learning Conference: Digital futures: learning in a connected world", (2011), 150 - 155. Talk: 1st Integrated Transport & Development Congress, Chicago; 03-13-2011 - 03-16-2011; in: "Integrated Transport & Development Congress", (2011), 1 - 10. Talk: REAL CORP 2011, 16th int. Conference on Urban Planning, Regional Development and Information Society; Change for Stability: Life-Cycles of Cities and Regions. The role and possibilities of Foresighted Planning in Transformation Processes, Essen, Deutschland (invited); 05-18-2011 - 05-20-2011; in: "REAL CORP 2011, change for stability: lifecycles of cities and regions", M. Schrenk, V. Popovich, P. Zeile (ed. ); (2011), ISBN: 978-3-9503110-1-3; 8 pages. Talk: The Bioelectromagnetics Society 33rd Annual Meeting, Halifax, Kanada; 06-12-2011 - 06-17-2011; in: "The Bioelectromagnetics Society 33rd Annual Meeting Abstract Collection - Platform Sessions", (2011), 132 - 133. Talk: 17th International Conference on Tools and Algorithms for the Construction and Analysis of Systems (TACAS), Saarbrücken, Germany; 03-26-2011 - 04-03-2011; in: "Proc. of 17th International Conference on Tools and Algorithms for the Construction and Analysis of Systems (TACAS)", LNCS / Springer, vol. 6605 (2011), ISBN: 978-3-642-19834-2; 326 - 340. Poster: CMSB 2011: the 9th ACM International Conference on Computational Methods in Systems Biology, Paris, France; 09-21-2011 - 09-23-2011; in: "Proc. of CMSB 2011: the 9th ACM International Conference on Computational Methods in Systems Biology", ACM, (2011), ISBN: 978-1-4503-0817-5; 103 - 112. Talk: CMSB 2011: the 9th ACM International Conference on Computational Methods in Systems Biology, Paris, France; 09-21-2011 - 09-23-2011; in: "Proc. of CMSB 2011: the 9th ACM International Conference on Computational Methods in Systems Biology", ACM, (2011), ISBN: 978-1-4503-0817-5; 103 - 112. Talk: CAV 2011: the 23rd International Conference on Computer Aided Verification, Snowbird, UT, USA; 07-14-2011 - 07-20-2011; in: "CAV 2011: the 23rd International Conference on Computer Aided Verification", LNCS / Springer, vol. 6806 (2011), ISSN: 0302-9743; 396 - 411. Keynote Lecture: SECAT 2011 Meeting of Spanish Catalysis Society, Universidad de Zaragoza, Spain (invited); 06-29-2011 - 07-01-2011; in: "SECAT 2011 Meeting of Spanish Catalysis Society, Universidad de Zaragoza", (2011), 1. Talk: Civil Engineering 11. 3rd International Conference,, Jelgava/Riga; 05-12-2011 - 05-13-2011; in: "Civil Engineering 11", (2011), 171 - 177. Talk: IUGG 2011 Conference Earth on the Edge - Science for a Sustainable Planet, Melbourne; 06-28-2011 - 07-07-2011; in: "Proceedings", (2011), ISBN: 978-190716118-6; 118 - 124. Poster: 2nd Annual Meeting Cleaner Combustion 2011, Zaragoza, Spanien; 09-07-2011 - 09-09-2011; in: "Cleaner Combustion 2011 Scientific Report", (2011), ISBN: 978-84-615-3062-5; 178 - 179. Talk: ComforEn 2011, Zweite Fachkonferenz, Kommunikation für Energienetze der Zukunft - Vom aktiven Verbraucher zum Smart Grid, Wels; 09-22-2011; in: "Tagungsband ComForEn 2011", (2011), 90 - 91. Poster: 16th International Symposium on Health-Related Water Microbiology, Rotorua, New Zealand; 09-18-2011 - 09-23-2011; in: "http://www.on-cue.co.nz/hrwm2011/abstracts.html", (2011), 3 pages. Talk: International Symposium on Location-Based Services, Wien; 11-21-2011 - 11-23-2011; in: "Proceedings of the 8th International Symposium on Location-Based Services", (2011), 14 pages. Talk: 11th Hellenic School and Workshops on Elementary Particle Physics and Gravity, Corfu; 09-04-2011 - 09-18-2011; in: "Proceedings of the Corfu Summer Institute 2011", Proceedings of Science, (2011), 030-1 - 030-13. Talk: 7th EURO-NF Conference on Next Generation Internet (NGI 2011), Kaiserslautern, Germany; 06-27-2011 - 06-29-2011; in: "7th EURO-NF Conference on Next Generation Internet (NGI 2011) Proceedings", (2011), ISBN: 978-1-4577-0917-3; 1 - 2. Talk: 7th EURO-NF Conference on Next Generation Internet (NGI 2011), Kaiserslautern, Germany; 06-27-2011 - 06-29-2011; in: "Proceedings of the Conference on Next Generation Internet 2011 (NGI2011)", (2011), ISBN: 978-1-4577-0917-3; 1 - 8. Poster: Archäometrie Salzburg, Salzburg (invited); 2011; in: "Archäometrie Salzburg", Archäometrie Salzburg, 3 (2011). Talk: PoS LAT2011, California, USA; 07-10-2011 - 07-16-2011; in: "29th Int. Symposium on Lattice Field Theory (Lattice 2011)", (2011). Talk: Expertenforum Kläranlage - Phosphorelimination, Stuttgart; 11-24-2011; in: "Tagungsband", (2011). Talk: The IEEE/RSJ International Conference on Intelligent Robots and Systems (IROS), San Francisco, CA; 09-25-2011 - 09-30-2011; in: "Proceedings of the IEEE/RSJ International Conference on Intelligent Robots and Systems (IROS 2011)", (2011), 8 pages. Poster: EUPOC 2011, Gargnano; 05-29-2011 - 06-03-2011; in: "Biobased polymers and related biomaterials : abstract booklet", (2011). Talk: 1st International Workshop of CoE PoliMat, Ljubljana; 12-01-2011 - 12-02-2011; in: "Contributions to the working session with the international scientific council", (2011), 45 - 47. Poster: Slovenski kemijski dnevi 2011, Portoroz; 09-14-2011 - 09-16-2011; in: "Abstracts", (2011). Talk: 2nd Conference on Applied Biocatalysis and 7th Meeting of Students and University Professors from Maribor and Zagreb, Maribor; 11-07-2011 - 11-08-2011; in: "Book of Abstracts", M. Leitgeb, M. Primozic (ed. ); (2011). Talk: 8.Internationalen Tagung "Schwingungen in rotierenden Maschinen" SIRM 2009, Wien; 02-23-2011 - 02-25-2011; in: "Tagungsbeiträge der 8.Internationalen Tagung "Schwingungen in rotierenden Maschinen"", H. Irretier, R. Nordmann, H. Springer, H. Ecker (ed. ); Technische Univ. Darmstadt, (2011), ISBN: 978-3-200-01412-1; 11 pages. Talk: SPS/IPC/DRIVES 2011, Nürnberg; 11-22-2011 - 11-24-2011; in: "Elektrische Automatisierung - Systeme und Komponenten, Fachmesse & Kongress", K. Bender, W. Schumacher (ed. ); (2011), ISBN: 978-3-8007-3379-8; 271 - 280. Talk: SPS/IPC/DRIVES 2011, Nürnberg; 11-22-2011 - 11-24-2011; in: "SPS/IPC/DRIVES 2011", K. Bender, W. Schumacher (ed. ); (2011), ISBN: 978-3-8007-3379-8; 253 - 262. Talk: International ISoLA Workshop on Software Aspects of Robotic Systems, Wien; 10-17-2011 - 10-18-2011; in: "Communications in Computer and Information Science, Vol. 336", (2011), ISBN: 978-3-642-34781-8; 156 - 161. Talk: International ISoLA Workshop on Software Aspects of Robotic Systems, Wien; 10-17-2011 - 10-18-2011; in: "Communications in Computer and Information Science, Vol. 336", (2011), ISBN: 978-3-642-34781-8; 144 - 149. Poster: 8th European Congress of Chemical Engineering, Berlin, Deutschland; 09-25-2011 - 09-29-2011; in: "www.ecce2011.de", (2011), 1 pages. Talk: Symposium "Establishing of Music, Composition and Marketing Platform, Council of Cultural Affairs, Wu-Feng, Taichung, Republic of China/Taiwan (invited); 08-18-2011 - 08-20-2011; in: "About the Empty Space and Endlessness in Architecture and Music. ", (2011), 88 - 89. Talk: International Symposium on Remote Sensing of Environment, Sydney; 04-10-2011 - 04-15-2011; in: "Proceedings 34th International Symposium on Remote Sensing of Environment", (2011), 4 pages. Talk: International Conference on Business, Management and Economics - ICBME, Altinyunus Resort Hotel and Convention Center, in Cesme / Izmir - Turkey; 10-06-2011 - 10-08-2011; in: "Proceedings of the 7th International Conference on Business, Management and Economics - ICBME´11", (2011), 1 pages. Talk: International Technology Management Conference (ITMC), San Jose, USA; 06-21-2011 - 06-24-2011; in: "Proceedings of the 2011 International Technology Management Conference", (2011), 6 pages. Talk: The International IEEE Annual Conference on Intelligent Transportation Systems (ITSC), Washington, DC, USA; 10-05-2011 - 10-07-2011; in: "Proceedings of the 14th International IEEE Conference on Intelligent Transportation Systems", (2011), 6 pages. Talk: SIBGRAPI, Alagoas, Brazil; 08-28-2011 - 08-31-2011; in: "Proceedings of the SIBGRAPI 2011", (2011), 6 pages. Talk: International Symposium on Computational Intelligence and Intelligent Informatics (ISCIII), Floriana, Malta; 09-15-2011 - 09-17-2011; in: "Proceedings of the 5th International Symposium on Computational Intelligence and Intelligent Informatics (ISCIII 2011)", (2011), 6 pages. Talk: HunDEM 2011 conference, Miskolc, Ungarn; 04-15-2011 - 04-22-2011; in: "Possibilities in terrain modelling 2011, Proceedings of HunDEM 2011 conference and round-table discussion", (2011), ISBN: 978-963-358-006-6; 8 pages. Talk: International Conference on Methods & Models in Automation & Robotics (MMAR), Miedzyzdroje, Poland; 08-22-2011 - 08-25-2011; in: "Proceedings of the 2011 16th International Conference on Methods & Models in Automation & Robotics (MMAR)", (2011), 6 pages. Talk: International Conference on Ubiquitious Robots and Ambient Intelligence (URAI), Incheon, Korea; 11-23-2011 - 11-26-2011; in: "Proceedings of the 8th International Conference on Ubiquitous Robots and Ambient Intelligence", (2011), 5 pages. Talk: Fechner Day - Meeting of the International Society for Psychophysics, Herzliya, Israel; 10-24-2011 - 10-27-2011; in: "Proceedings of the Fechner Day 2011", (2011), 6 pages. Poster: Rovereto Attention Workshop (RAW), Rovereto, Italy; 10-27-2011 - 10-29-2011; in: "Proceedings of the 4th Rovereto Attention Workshop (RAW 2011)", (2011), 1 pages. Talk: International Conference on Social Robotics (ICSR), Amsterdam, Netherlands; 11-24-2011 - 11-25-2011; in: "Proceedings of the 2nd International Conference on Social Robotics", (2011), 4 pages. Talk: International Conference on Computer Vision Systems (ICVS), Sophia Antipolis, France; 09-20-2011 - 09-22-2011; in: "Proceedings of the 8th International Conference on Computer Vision Systems (ICVS 2011)", (2011), 10 pages. Talk: The IEEE/RSJ International Conference on Intelligent Robots and Systems (IROS), San Francisco, Kalifornien; 09-25-2011 - 09-30-2011; in: "Proceedings of the 2011 IEEE/RSJ International Conference on Intelligent Robots and Systems", (2011), 6 pages. Talk: IEEE Conference on Computer Vision and Pattern Recognition (CVPR), Colorado Springs, USA; 06-20-2011 - 06-23-2011; in: "Proceedings of the IEEE Computer Vision and Pattern Recognition (CVPR) 2011", (2011), 3 pages. Talk: 2011 Robotics: Science and Systems Conference, Los Angeles, California, USA; 06-27-2011 - 07-07-2011; in: "Workshop Proceedings of the 2011 Robotics: Science and Systems Conference", (2011), 2 pages. Talk: International Conference on Computer Vision ICCV, Barcelona; 11-06-2011 - 11-13-2011; in: "Workshop Proceedings of the 13th International Conference on Computer Vision", (2011), 2 pages. Talk: eHealth 2011, Wien; 05-26-2011 - 05-27-2011; in: "eHealth2011: Health Informatics meets eHealth - von der Wissenschaft zur Anwendung und zurück Grenzen überwinden - Continuity of Care", G. Schreier, D. Hayn, E. Ammenwerth (ed. ); OCG, 279 (2011), ISBN: 385403279x; ##. Talk: ÖTG-Symposium, Wr. Neustadt; 11-24-2011; in: "Tribologie in Industrie und Forschung, Werkstoff- und Energieeffizienz - Herausforderung und Lösungsansätze", (2011), ISBN: 978-3-901657-40-5; 203. Talk: 13th International Society for Music Information Retrieval Conference (ISMIR 2012), Miami; 10-24-2011 - 10-28-2011; in: "Proceedings of the 13th International Society for Music Information Retrieval Conference (ISMIR 2012)", University of Miami, (2011), ISBN: 978-0-615-54865-4; 337 - 342. Poster: Flow Chemistry Europe 2011, Munich, D; 03-28-2011 - 03-29-2011; in: "Book of Abstracts", (2011), 1 pages. Talk: Archtheo 2011, Istanbul; 11-2011; in: "Theory for the Sake of Theory", Dakam, (2011), 362 - 368. Talk: Archtheo 2011, Istanbul; 11-2011; in: "Theory for the Sake of Theory", Dakam, (2011), 191 - 201. 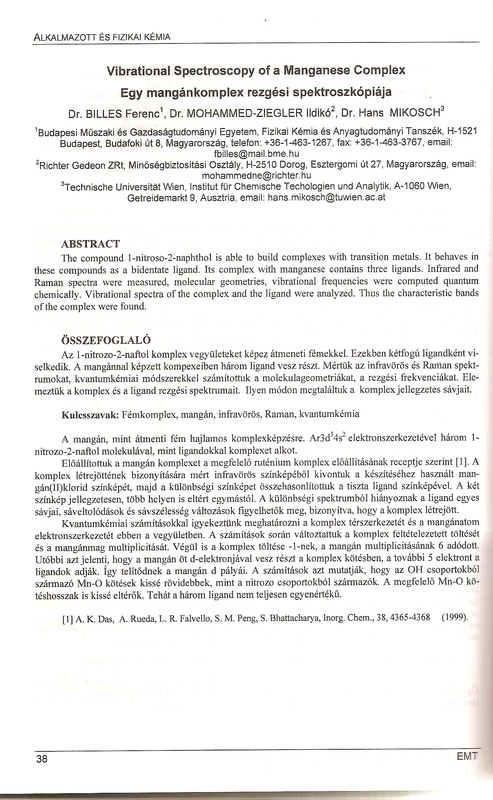 Talk: 19th Annual Meeting of the BioEnvironmental Polymer Society (BEPS), Wien; 09-28-2011 - 09-30-2011; in: "19th Annual Meeting of the BioEnvironmental Polymer Society", (2011), ISBN: 978-3-9502992-3-6; OP-10. Talk: Forum Rohstoffe, Bad Ausee (invited); 04-13-2011; in: "Informationsveranstaltung des Forum Rohstoffe und der WKO Fachverband Steine-Keramik", (2011), 3 - 5. Talk: FSV-Preis 2011, Wien (invited); 11-22-2011; in: "Wir finden neue Wege - die Jugend geht mit", FSV, (2011), 19 - 24. Talk: 19. Fachtagung 2011 Lasermethoden in der Strömungsmesstechnik, Ilmenau; 09-06-2011 - 09-08-2011; in: "Lasermethoden in der Strömungsmesstechnik", (2011). Talk: 26th European Photovoltaic Solar Energy Conference and Exhibition, Hamburg; 09-05-2011 - 09-09-2011; in: "Proceedings of the 26th EU PVSEC", (2011), ISBN: 3-936338-27-2; 3 pages. Talk: 26th European Photovoltaic Solar Energy Conference and Exhibition, Hamburg; 09-05-2011 - 09-09-2011; in: "Proceedings of the 26th EU PVSEC", (2011), ISBN: 3-936338-27-2; 5 pages. Talk: ICPE - 5th International Congress on Pharmaceutical Engineering, Graz; 09-29-2011 - 09-30-2011; in: "Book of Abstracts", (2011), 33. Talk: ICPE - 5th International Congress on Pharmaceutical Engineering, Graz; 09-29-2011 - 09-30-2011; in: "Book of Abstracts", (2011), 43. Talk: 15th European Conference on Pattern Languages of Programs, EuroPLoP 2010, Irsee, Germany; 07-07-2010 - 07-11-2010; in: "Proceedings of the 15th European Conference on Pattern Languages of Programs, EuroPLoP 2010", M. Weiss, P. Avgeriou (ed. ); ACM, (2011), ISBN: 978-1-4503-0259-3; Paper ID 21, 22 pages. Talk: 15th International Conference on Narrow Gap Systems, Blacksburg, USA; 08-01-2011 - 08-05-2011; in: "AIP Conference Proceedings", (2011), 49 - 51. Talk: 12th International Conference on Computer Systems and Technologies, Wien; 06-16-2011 - 06-17-2011; in: "Proceedings of the 12th International Conference on Computer Systems and Technologies", New York (2011), 311 - 316. Talk: Mensch & Computer 2011. überMEDIEN|ÜBERmorgen., Chemnitz; 09-11-2011 - 09-14-2011; in: "Workshop-Proceedings der Tagung Mensch & Computer 2011. überMEDIEN|ÜBERmorgen. ", Universitätsverlag der TU Chemnitz, Chemnitz (2011), ISBN: 3941003380; 25 - 28. Talk: International Conference on "Cultural Heritage and New Technologies", Wien; 11-14-2011 - 11-16-2011; in: "International Conference on Cultural Heritage and New Technologies", (2011), ISBN: 978-3-200-02740-4; 242 - 247. Talk: CFD 2011 - 8th International Conference on Computational Fluid Dynamics, Trondheim, Norwegen; 06-21-2011 - 06-23-2011; in: "CFD 2011", (2011), ISBN: 978-82-519-2811-3; 9 pages. Talk: European Solid-State Device Research Conference (ESSDERC), Helsinki, Finland; 09-12-2011 - 09-16-2011; in: "ESSDERC 2011 - 41st European Solid State Device Research Conference", (2011), 75 - 78. Talk: 1st Scientific Meeting COST Action IC1004, Lund, Sweden; 06-20-2011 - 06-21-2011; in: "Proceeding 1st Sceintific Meeting COST IC1004", (2011), 8 pages. Talk: 12th International Conference on Multiphoton Processes (ICOMP12), Sapporo, Japan (invited); 07-03-2011 - 07-06-2011; in: "Proceedings of the 12th International Conference on Multiphoton Processes (ICOMP12)", (2011). Talk: Proceedings of the DAGA 2011, Düsseldorf; 03-21-2011 - 03-24-2011; in: "Proceedings of the DAGA 2011", J. Becker-Schweitzer, G. Notbohm (ed. ); (2011), 139 - 140. Talk: Proceedings of the DAGA 2011, Düsseldorf; 03-21-2011 - 03-24-2011; in: "Proceedings of the DAGA 2011", J. Becker-Schweitzer, G. Notbohm (ed. ); (2011), 523 - 524. Talk: Proceedings of 19th International Conference on Computer Methods in Mechanics, Warsaw; 05-2011; in: "Proceedings of 19th International Conference on Computer Methods in Mechanics", M. Kleiber (ed. ); (2011). Talk: Proceedings of the 10th International Conference on the Mathematical and Numerical Aspects of Waves, Vancouver; 07-25-2011 - 07-29-2011; in: "Proceedings of the 10th International Conference on the Mathematical and Numerical Aspects of Waves", N. Nigam (ed. ); (2011), 455 - 458. Talk: International Conference on Finite Elements in Flow Problems, München; 03-23-2011 - 03-25-2011; in: "International Conference on Finite Elements in Flow Problems", W.A. Wall (ed. ); (2011), 225. Talk: 16th International Conference on Cultural Heritage and New Technologies, Wien; 11-14-2011 - 11-16-2011; in: "Cultural Heritage and New Technologies", (2011), ISBN: 978-3-200-02740-4; 294 - 303. Talk: Pan European Voice Conference, Marseille, France; 08-31-2011 - 09-03-2011; in: "Pan European Voice Conference", A. Giovanni (ed. ); (2011), 195. Talk: 12th International Conference on Thermal, Linz; 04-18-2011 - 04-20-2011; in: "Mechanical & Multi-Physics Simulation and Experiments in Microelectronics and Microsystems", M. Jungwirth (ed. ); (2011), ISBN: 978-1-4577-0107-8; 1 - 6. Talk: AMA Service GmbH, Nürnberg; 06-07-2011 - 06-09-2011; in: "Proceedings of Sensor+Test Conference 2011", AMA Service GmbH., (2011), ISBN: 3981099397; 228 - 233. Talk: IEEE International Conference on Robotics and Biomimetics (IEEE-ROBIO), Phuket Island, Thailand; 12-07-2011 - 12-11-2011; in: "Proceedings of the 2011 IEEE International Conference on Robotics and Biomimetics", (2011), 8 pages. Talk: International Conference on Ubiquitous Robots and Ambient Intelligence (URAI), Incheon, Korea; 11-23-2011 - 11-26-2011; in: "Proceedings of the 8th International Conference on Ubiquitous Robots and Ambient Intelligence (URAI 2011)", (2011), 6 pages. Talk: 12th International Symposium on Virtual Reality, Archaeology and Intelligent Cultural Heritage (VAST 2011), Prato, Italien; 10-18-2011 - 10-21-2011; in: "VAST 11", Eurographics Association, (2011), ISBN: 978-3-905674-34-7; 45 - 48. Talk: Gender and Interdisciplinary Education for Engineers 2011, Paris (invited); 06-23-2011 - 06-24-2011; in: "Gender and Interdisciplinary Education for Engineers 2011", A. Béraud, A. Godfroy, J. Michel (ed. ); Sense Publishers, (2011), 401. Talk: Paper presented at IX. Biennial of European Towns and Town Planners, Genova (invited); 09-14-2011 - 09-17-2011; in: "Smart Planning for Europe's Gateway Cities, in A. Vergano and A. Caruana", Rome: INU Edizioni Srl., 8eds, Rome (2011), ISBN: 978-88-7603-060-4. Talk: 24th World Road Congress, Mexico City/MEX; 09-26-2011 - 09-30-2011; in: "Proceedings", (2011), 17 pages. Talk: Facing the Multicore Challenge II, Karlsruhe, Germany; 09-28-2011 - 09-30-2011; in: "Proceedings of Facing the Multicore Challenge II", (2011), 11 pages. Talk: Innovative Smart Grid Technologies (ISGT Europe), 2011 2nd IEEE PES International Conference and Exhibition on Innovative Smart Grid Technologies (ISGT Europe), Manchester, Great Britain; 12-05-2011 - 12-07-2011; in: "Proceedings of the Innovative Smart Grid Technologies (ISGT Europe), 2011 2nd IEEE PES International Conference and Exhibition on Innovative Smart Grid Technologies (ISGT Europe)", (2011), 1 - 7. Talk: International Semiconductor Device Research Symposium (ISDRS), Washington DC , USA; 12-07-2011 - 12-09-2011; in: "Proceedings of the International Semiconductor Device Research Symposium (ISDRS 2011)", (2011), ISBN: 978-1-4577-1754-3; 2 pages. Talk: International Scientific and Applied Science Conference on Electronics, Sozopol, Bulgaria; 09-14-2011 - 09-16-2011; in: "Annual Journal of Electronics", (2011), 113 - 116. Talk: Sensor+Test Conference, Nürnberg; 06-07-2011 - 06-09-2011; in: "Sensor+Test Conference 2011 Proceedings", AMA Service GmbH, (2011), ISBN: 978-3-9810993-9-3; 343 - 348. Talk: XXIIIrd International CIPA Symposium, Prag, Tschechien; 09-12-2011 - 09-16-2011; in: "XXIIIrd International CIPA Symposium", CIPA, ISPRS, Czech Technical University in Prague and Czech Society for Photogrammetry and Remote Sensing, Prag (2011), ISBN: 978-80-01-04885-6; 8 pages. Talk: 2nd MC and Scientific Meeting, Lisbon, Portugal; 10-19-2011 - 10-21-2011; in: "Cooperative Radio Communications for Green and Smart Environments COST IC1004", (2011), 1 - 5. Talk: IEEE Africon 2011, Zambia, Afrika; 09-13-2011 - 09-15-2011; in: "Proceedings of the 10th IEEE Africon 2011", (2011), ISBN: 978-1-61284-991-1; 1 - 6. Talk: Tag der Hydrologie 2011, Wien; 03-24-2011 - 03-25-2011; in: "Hydrologie & Wasserwirtschaft - von der Theorie zur Praxis", Forum für Hydrologie und Wasserbewirtschaftung, 30.11 (2011), ISBN: 978-3-941897-79-3; 29 - 35. Poster: Frontiers in Silicon Chemistry 2011, Munich, Germany; 04-14-2011 - 04-15-2011; in: "1st Munich Forum on Functional Materials", (2011), A58. Talk: Computational Vision and Medical Image Processing: VipIMAGE 2011, Algarve, Portugal; 10-12-2011 - 10-14-2011; in: "Computational Vision and Medical Image Processing: VipIMAGE 2011", (2011), ISBN: 9780415683951; 347 - 352. Talk: 18th IFAC World Congress, Milan; 08-28-2011 - 09-02-2011; in: "Proceedings of the 18th IFAC World Congress", 18th IFAC World Congress / Volume# 18 / Part# 1 (2011), ISBN: 978-3-902661-93-7; 12680 - 12685. Talk: 13th International EUROCAST Conference, Las Palamas de Gran Canaria, Spain; 02-06-2011 - 02-11-2011; in: "Computer Aided Systems Theory - EUROCAST 2011", R. Moreno-Díaz, F. Pichler, A. Quesada-Arencibia (ed. ); Springer, Revised Selected Papers, Part I (2011), ISBN: 978-3-642-27548-7; 18 - 24. Talk: CHNT 2011 16th International Conference on Cultural Heritage and New Technologies, Wien, Österreich; 11-14-2011 - 11-16-2011; in: "Proc. 16th International Conference on Cultural Heritage and New Technologies", W. Börner et al. (ed. ); (2011), 304 - 313. Talk: Carbon-Based Low Dimensional Materials (Carbomat), Catania, Italy; 12-05-2011 - 12-07-2011; in: "Proceedings of the 2nd CARBOMAT Workshop", (2011), ISBN: 978-88-8080-124-5; 19 - 22. Talk: Asilomar Conference on Signals, Systems, and Computers, Pacific Grove, CA; 11-06-2011 - 11-09-2011; in: "Forty Fifth Asilomar Conference on Signals, Systems, and Computers (ASILOMAR), 2011", (2011), 5 pages. Poster: IEEE Conference on Computer Vision and Pattern Recognition (CVPR) 2011, Colorado Springs; 06-21-2011 - 06-23-2011; in: "IEEE Computer Vision and Pattern Recognition", (2011), 8 pages. Poster: IGARSS, Vancouver, Canada; 07-24-2011 - 07-29-2011; in: "IEEE International Geoscience and Remote Sensing Symposium 2011 (IGARSS2011)", (2011), 3132 - 3135. Talk: Norchip Conference, Lund, Schweden; 11-14-2011 - 11-15-2011; in: "NORCHIP 2011", (2011), ISBN: 978-1-4577-0515-1; 4 pages. Talk: Symposium on VLSI Technology, Kyoto, Japan; 06-14-2011 - 06-16-2011; in: "2011 Symposium on VLSI Technology Digest of Technical Papers", (2011), ISBN: 978-1-4244-9949-6; 2 pages. Talk: Defects and restoration of building envelope structures - Poruchy a obnova obalovych konstrukcii budov, Vysoke Tatry - SLOVAKIA; 04-13-2011 - 04-15-2011; in: "Defects and restoration of building envelope structures - Poruchy a obnova obalovych konstrukcii budov", Technicka univerzita v Kosiciach - Stavebna fakulta, April 2011 - Podbanske - Vysoke Tatry - SLOVAKIA (2011), ISBN: 978-80-553-0651-3; 129 - 140. Talk: VI European Summer School on Experimental Nuclear Astrophysics, Acireale , Italien; 09-18-2011 - 09-27-2011; in: "PoS (ENAS 6)", Proceedings of Science, 148/015 (2011), ISSN: 1824-8039; 1 - 8. Talk: 27th EuroForth Conference, Wien; 09-23-2011 - 09-25-2011; in: "27th EuroForth Conference", M.A. Ertl (ed. ); (2011), 32 - 35. Talk: 27th EuroForth Conference, Wien; 09-23-2011 - 09-25-2011; in: "27th EuroForth Conference", M.A. Ertl (ed. ); (2011), 36 - 41. Talk: DET 2011, Athens; 09-28-2011 - 09-30-2011; in: "Proceedings of the 7th International Conference on Digital Enterprise Technology", G. Chryssolouris, D. Mourtzis (ed. ); (2011), ISBN: 978-960-88104-2-6; 101 - 108. Talk: Central European Functional programming School (CEFP) - PhD Workshop, Budapest; 06-18-2011 - 06-23-2011; in: "Central European Functional Programming School - PhD Workshop", (2011), 3 pages. Talk: 44th CIRP Conference on Manufacturing Systems, Madison, Wisconsin; 05-31-2011 - 06-03-2011; in: "New Worlds of Manufacturing", N. Duffie (ed. ); (2011), 6 pages. Talk: Austrochip 2011, Wien; 09-26-2011; in: "Tagungsband Austrochip 2011", (2011), 39 - 43. Talk: 6th Workshop on Workflows in Support of Large-Scale Science, WORKS 2011 co-located with SC 2011, Seattle, Washington, USA; 11-14-2011; in: "Proceedings of the 6th Workshop on Workflows in Support of Large-Scale Science, WORKS 2011 co-located with SC 2011", ACM, (2011), ISBN: 978-1-4503-1100-7; 37 - 46. Talk: Proceedings of the 30th Annual ACM Symposium on Principles of Distributed Computing (PODC'11), San Jose; 06-06-2011 - 06-08-2011; in: "PODC'11", ACM, (2011), 227 - 228. Poster: Tag der Hydrologie 2011, Wien; 03-24-2011 - 03-25-2011; in: "Hydrologie & Wasserwirtschaft - von der Theorie zur Praxis", Forum für Hydrologie und Wasserbewirtschaftung, 30.11 (2011), ISBN: 978-3-941897-79-3; 383. Poster: Tag der Hydrologie 2011, Wien; 03-24-2011 - 03-25-2011; in: "Hydrologie & Wasserwirtschaft - von der Theorie zur Praxis", Forum für Hydrologie und Wasserbewirtschaftung, 30.11 (2011), ISBN: 978-3-941897-79-3; 380. Poster: Tag der Hydrologie 2011, Wien; 03-24-2011 - 03-25-2011; in: "Hydrologie & Wasserwirtschaft - von der Theorie zur Praxis", Forum für Hydrologie und Wasserbewirtschaftung, 30.11 (2011), ISBN: 978-3-941897-79-3; 355. Poster: Tag der Hydrologie 2011, Wien; 03-24-2011 - 03-25-2011; in: "Hydrologie & Wasserwirtschaft - von der Theorie zur Praxis", Forum für Hydrologie und Wasserbewirtschaftung, 30.11 (2011), ISBN: 978-3-941897-79-3; 323. Talk: Tag der Hydrologie 2011, Wien; 03-24-2011 - 03-25-2011; in: "Hydrologie & Wasserwirtschaft - von der Theorie zur Praxis", Forum für Hydrologie und Wasserbewirtschaftung, 30.11 (2011), ISBN: 978-3-941897-79-3; 280 - 286. Talk: Tag der Hydrologie 2011, Wien; 03-24-2011 - 03-25-2011; in: "Hydrologie & Wasserwirtschaft - von der Theorie zur Praxis", Forum für Hydrologie und Wasserbewirtschaftung, 30.11 (2011), ISBN: 978-3-941897-79-3; 221 - 229. Talk: Tag der Hydrologie 2011, Wien; 03-24-2011 - 03-25-2011; in: "Hydrologie & Wasserwirtschaft - von der Theorie zur Praxis", Forum für Hydrologie und Wasserbewirtschaftung, 30.11 (2011), ISBN: 978-3-941897-79-3; 152 - 158. Talk: Structural Information and Communication Complexity, Gdansk; 06-26-2011 - 06-29-2011; in: "Proceedings 18th International Colloquium on Structural Information and Communication Complexity (SIROCCO'11)", Springer Berlin / Heidelberg, (2011), ISBN: 978-3-642-22211-5; 42 - 53. Talk: International Parallel and Distributed Processing Symposium (IPDPS), Anachorage, Alaska; 05-16-2011 - 05-20-2011; in: "IPDPS Workshops", (2011), ISBN: 978-1-61284-425-1; 1488 - 1495. Talk: International Conference On Principles Of Distributed Systems (OPODIS), Toulouse; 12-12-2011 - 12-16-2011; in: "OPODIS'11", Springer Berlin / Heidelberg, (2011), 299 - 312.
accepted as talk for: 39th Annual International Conference on Computer Applications and Quantitative Methods on Archaeology - CAA 2011, Peking, China; 04-12-2011 - 04-16-2011; in: "39th Annual International Conference on Computer Applications and Quantitative Methods on Archaeology - CAA 2011", (2011). Talk: 7th IEEE International Conference on eScience (eScience 2011), Stockholm, Sweden; 12-05-2011 - 12-08-2011; in: "Proceedings of the 7th IEEE International Conference on eScience (eScience 2011)", IEEE Computer Society, (2011), ISBN: 978-0-7695-4597-4; 105 - 112. Talk: The 13th International Conference on Information Integration and Web-based Applications & Services (iiWAS2011), Ho Chi Minh City, Vietnam; 12-05-2011 - 12-07-2011; in: "Proceedings of the 13th International Conference on Information Integration and Web-based Applications & Services, iiWAS 2011", D. Taniar, E. Pardede, H. Nguyen, W. Rahayu, I. Khalil Ibrahim (ed. ); ACM, (2011), ISBN: 978-1-4503-0784-0; 507 - 510. Talk: International Reliability Physics Symposium (IRPS), Monterey (Tutorial); 04-10-2011 - 04-14-2011; in: "Conference Proceedings of International Reliability Physics Symposium (IRPS 2011)", (2011), 128 pages. Talk: VÖZ Kolloquium 2011 Forschung und Entwicklung für Zement und Beton, Wien (invited); 11-09-2011; in: "Kolloquium 2011 Forschung & Entwicklung für Zement und Beton, Kurzfassungen der Beiträge, Ausgabe 9.11.2011", (2011), 2 pages. Talk: IEEE International Integrated Reliability Workshop, South Lake Tahoe, USA (invited); 10-16-2011 - 10-20-2011; in: "Final Report of IEEE International Integrated Reliability Workshop (IIRW 2011)", (2011), 32. Talk: IEEE International Integrated Reliability Workshop, South Lake Tahoe, USA; 10-16-2011 - 10-20-2011; in: "Final Report of IEEE International Integrated Reliability Workshop (IIRW 2011)", (2011), 12 - 16. Talk: IEEE International Integrated Reliability Workshop, South Lake Tahoe, USA; 10-16-2011 - 10-20-2011; in: "Final Report of IEEE International Integrated Reliability Workshop (IIRW 2011)", (2011), 27 - 31. Talk: International Conference on Ubiquitious Robots and Ambient Intelligence (URAI), Songdo ConventiA, Incheon, Korea; 11-23-2011 - 11-26-2011; in: "Proc. of the 8th International Conference on Ubiquitous Robots and Ambient Intelligence (URAI 2011)", (2011), 1 pages. Talk: IEEE International Conference on Robotics and Biomimetics (IEEE-ROBIO), Phuket, Thailand; 12-07-2011 - 12-11-2011; in: "Proc. of the IEEE International Conference on Robotics and Biomimetics (ROBIO 2011)", (2011), 6 pages. Talk: ISSEP2011, Bratislava; 10-26-2011 - 10-29-2011; in: "Informatics in Schools: Situation, Evolution and Perspectives", D. Bezakova, I. Kalas (ed. ); (2011), ISBN: 978-80-89186-90-7; 32. Talk: ISSEP2011, Bratislava; 10-26-2011 - 10-29-2011; in: "Informatics in Schools: Situation, Evolution and Perspectives", D. Bezakova, I. Kalas (ed. ); (2011), ISBN: 978-80-89186-90-7; 37. Talk: INFOS 2011, Münster; 09-12-2011 - 09-15-2011; in: "Informatik mit Kopf, Herz und Hand - Praxisbeiträge zur INFOS 2011", M. Weigend, F. Otte, M. Thomas (ed. ); ZfL-Verlag Münster, (2011), ISBN: 978-3-86877-009-4; 111 - 120. Talk: 50th IEEE Conference on Decision and Control and European Control Conference (CDC-ECC), Orlando, FL, USA; 12-12-2011 - 12-15-2011; in: "Proceedings of the 50th IEEE Conference on Decision and Control and European Control Conference (CDC-ECC)", (2011), ISBN: 978-1-4244-7744-9; 2776 - 2781. Talk: GMA-Fachausschuss 1.40 "Theoretische Verfahren der Regelungstechnik", Anif/Salzburg; 09-18-2011 - 09-21-2011; in: "Tagungsband GMA-Fachausschuss 1.40 "Theoretische Verfahren der Regelungstechnik"", (2011), 332 - 344. Talk: GMA-Fachausschuss 1.40 "Theoretische Verfahren der Regelungstechnik", Anif/Salzburg; 09-18-2011 - 09-21-2011; in: "Tagungsband GMA-Fachausschuss 1.40 "Theoretische Verfahren der Regelungstechnik"", (2011), 142 - 163. Talk: GMA-Fachausschuss 1.30 "Modellbildung, Identifikation und Simulation in der Automatisierungstechnik", Anif/Salzburg; 09-21-2011 - 09-23-2011; in: "Tagungsband GMA-Fachausschuss 1.30 "Modellbildung, Identifikation und Simualtion in der Automatisierungstechnik"", (2011), 39 - 62. Talk: GMA-Fachausschuss 1.40 "Theoretische Verfahren der Regelungstechnik", Anif/Salzburg; 09-18-2011 - 09-21-2011; in: "Tagungsband GMA-Fachausschuss 1.40 "Theoretische Verfahren der Regelungstechnik"", TU Wien, Institut für Automatisierungs- und Regelungstechnik, Wien (2011), ISBN: 978-3-9502451-4-1; 205 - 220. Talk: IEEE International Conference on Multimedia and Expo (ICME), Barcelona, Spain; 07-11-2011 - 07-15-2011; in: "Proceedings of the IEEE International Conference on Multimedia and Expo (ICME 2011)", (2011), 1 - 6. Talk: The Fifth Pacific-Rim Symposium on Image and Video Technology, Gwangju, South Korea; 11-20-2011 - 11-23-2011; in: "Advances in Image and Video Technology", Springer Verlag, (2011), ISBN: 978-3-642-25345-4; 165 - 177. Talk: Tag der Hydrologie 2011, Wien; 03-24-2011 - 03-25-2011; in: "Hydrologie & Wasserwirtschaft - von der Theorie zur Praxis", G. Blöschl, R. Merz (ed. ); Forum für Hydrologie und Wasserbewirtschaftung, 30.11 (2011), ISBN: 978-3-941897-79-3; 129 - 135. Talk: Tag der Hydrologie 2011, Wien; 03-24-2011 - 03-25-2011; in: "Hydrologie & Wasserwirtschaft - von der Theorie zur Praxis", Forum für Hydrologie und Wasserbewirtschaftung, 30.11 (2011), ISBN: 978-3-941897-79-3; 121 - 128. Talk: Tag der Hydrologie 2011, Wien; 03-24-2011 - 03-25-2011; in: "Hydrologie & Wasserwirtschaft - von der Theorie zur Praxis", G. Blöschl, R. Merz (ed. ); Forum für Hydrologie und Wasserbewirtschaftung, 30.11 (2011), ISBN: 978-3-941897-79-3; 110 - 120. Talk: Tag der Hydrologie 2011, Wien; 03-24-2011 - 03-25-2011; in: "Hydrologie & Wasserwirtschaft - von der Theorie zur Praxis", G. Blöschl, R. Merz (ed. ); Forum für Hydrologie und Wasserbewirtschaftung, 30.11 (2011), ISBN: 978-3-941897-79-3; 36 - 42. Talk: DHA 30, Dyes in History and Archaeology 30, University of Derby, United Kingdom; 10-12-2011 - 10-15-2011; in: "DHA 30, Dyes in History and Archaeology, Book of Abstracts", (2011), 16. Talk: The Sixth Jordanian International Conference of Chemistry and the 11th Jordanian Chemical Conference, Irbid, Jordan (invited); 04-19-2011 - 04-21-2011; in: "The Sixth Jordanian International Conference of Chemistry and the 11th Jordanian Chemical Conference", (2011), 24. Talk: 1st International Workshop on Security and Privacy in Social Networks (SPSN 2011) in conjunction with IEEE SocialCom 2011, Boston Massachusetts, USA; 10-09-2011 - 10-11-2011; in: "Proceedings of the IEEE International Conference on Privacy, Security, Risk and Trust and IEEE International Conference on Social Computing (PASSAT/SocialCom 2011)", IEEE Computer Society, (2011), ISBN: 978-0-7695-4578-3; 1352 - 1355. Talk: 7th International Conference on Information Assurance and Security (IAS 2011), Malacca, Malaysia; 12-05-2011 - 12-08-2011; in: "Proceedings of the 7th International Conference on Information Assurance and Security (IAS 2011)", A. Abraham, D. Zeng, D. Agrawal, M. Abdollah, E. Corchado, V. Casola, C. Huoy (ed. ); IEEE Computer Society, (2011), ISBN: 978-1-4577-2153-3; 286 - 291. Talk: DWA/VDI-Fachtagung "Mess- und Regelungstechnik in Abwassertechnischen Anlagen", Fulda; 10-25-2011 - 10-26-2011; in: "Tagungsband", (2011). Talk: WS4C 2011, Berlin; 10-04-2011 - 10-07-2011; in: "Workshop on Software Language Engineering for Cyber-physical Systems", (2011). Talk: The 7th ASME/IEEE International Conference on Mechatronic and Embedded Systems and Applications, Washington; 08-29-2011 - 08-31-2011; in: "International Conference on Mechatronic and Embedded Systems and Applications", ASME, (2011). Talk: 9th International Conference on Frontiers of Information Technology, FIT 2011, Islamabad, Pakistan; 12-19-2011 - 12-21-2011; in: "Proceedings of the 9th International Conference on Frontiers of Information Technology, FIT 2011", IEEE Computer Society, (2011), ISBN: 978-0-7695-4625-4; 206 - 211. Talk: FMICS 2011, Trento; 08-29-2011 - 08-30-2011; in: "Formal Methods for Industrial Critical Systems", Springer Berlin / Heidelberg, (2011), ISBN: 978-3-642-24430-8; 37 - 51. Talk: EMSOFT2011, ACM international conference on Embedded software, Taipei; 10-09-2011 - 10-14-2011; in: "EMSOFT '11 Proceedings of the ninth ACM international conference on Embedded software", ACM New York, (2011), ISBN: 978-1-4503-0714-7; 117 - 126. Talk: 2nd International Conference on Runtime Verification (RV 2011), San Francisco; 09-27-2011 - 09-30-2011; in: "Runtime Verification", (2011), 239 - 244. Talk: Annual Computer Security Applications Conference (ACSAC), Orlando, Florida; 12-05-2011 - 12-09-2011; in: "Proceedings of the 27th Annual Computer Security Applications Conference", ACM, 27 (2011), ISBN: 978-1-4503-0672-0. Talk: Annual Computer Security Applications Conference (ACSAC), Orlando, Florida; 12-05-2011 - 12-09-2011; in: "Proceedings of the 27th Annual Computer Security Applications Conference", ACM, New York (2011), ISBN: 978-1-4503-0672-0. Keynote Lecture: 1st Conference of the Czech Society for Mass Spectrometry, Hradec Kralove (invited); 10-19-2011 - 10-21-2011; in: "Proceedings of the 1st Conference of the Czech Society for Mass Spectrometry", (2011), ISBN: 9788090504509; 21. Talk: 9. Internationale Tagung Schwingungen in rotierenden Maschinen (SIRM 2011), Darmstadt; 02-21-2011 - 02-23-2011; in: "Tagungsbeiträge - Proceedings SIRM 2011", R Markert (ed. ); Technische Univ. Darmstadt, (2011), ISBN: 978-3-9814163-0-5; Paper ID ID-10, 10 pages. Talk: 7th European Nonlinear Dynamics Conference ENOC 2011, Rom; 07-24-2011 - 07-29-2011; in: "Proceedings of the 7th European Nonlinear Dynamics Conference (ENOC 2011)", D. Bernardini, G. Rega, F Romeo (ed. ); (2011), ISBN: 978-88-906234-2-4; 2 pages. Talk: 7th European Nonlinear Dynamics Conference ENOC 2011, Rom; 07-24-2011 - 07-29-2011; in: "Proceedings of the 7th European Nonlinear Dynamics Conference (ENOC 2011)", D. Bernardini, G. Rega, F Romeo (ed. ); (2011), ISBN: 978-88-906234-2-4; 6 pages. Talk: XVII. Nemzetközi Vegyészkonferencia, Cluj-Napoca; 11-03-2011 - 11-06-2011; in: "17th International Conference on Chemistry", (2011), 38. Talk: Kinder zum Olymp!, Dessau (invited); 06-23-2011 - 06-24-2011; in: "Kinder zum Olymp! Selbstverständlich! Kulturelle Bildung in der Schule", (2011), ISBN: 3-929110-15-6; 95 - 96. Talk: AVL AST International User Conference 2011, Graz (invited); 06-28-2011 - 06-30-2011; in: "AVL AST International User Conference 2011", AVL List GmbH (ed. ); (2011), 9 pages. Talk: The 1th International Technology Management Conference (ITMC 2011), San Jose, California, USA; 06-27-2011 - 06-30-2011; in: "Proceedings of the 1th International Technology Management Conference", IEEE, (2011), ISBN: 978-1-61284-952-2; 357 - 362. Talk: The International Conference on Engineering and Information Management (ICEIM 2011), Chengdu, China; 04-15-2011 - 04-18-2011; in: "Proceedings of the International Conference on Engineering and Information Management", (2011), ISBN: 978-1-4244-9770-6; 1 - 5. Talk: ECO-MOBILITY 2011, Wien (invited); 11-15-2011 - 11-16-2011; in: "Web Proceedings of the ECO-MOBILITY 2011 Conference", (2011), 10 pages. Talk: The Second international conference on Electronic government and the information systems perspective (EGOVIS'11), Toulouse, France; 08-29-2011 - 09-02-2011; in: "Proceedings of the Second international conference on Electronic government and the information systems perspective (EGOVIS'11)", K. Andersen, E. Francesconi, Å. Grönlund, T. van Engers (ed. ); Springer-Verlag, Berlin, Heidelberg (2011), ISBN: 978-3-642-22960-2; 56 - 67. Talk: Dubrovnik Conference on Sustainable Development of Energy, Water and Environment Systems, Dubrovnik, Kroatien; 09-25-2011 - 09-29-2011; in: "Proceedings of the 6th Conference", (2011), ISBN: 978-953-7738-12-9; 1 - 7. Talk: International MTZ Conference, Kiel (invited); 11-15-2011 - 11-16-2011; in: "Heavy-Duty, On- and Off-Highway Engines 6th International MTZ Conference", Springer Fachmedien Wiesbaden GmbH, (2011), 14 pages. Talk: 10th International Conference on Engines & Vehicles, Naples (invited); 09-11-2011 - 09-15-2011; in: "ICE2011", SAE International (ed. ); SAE Naples Section, Naples (2011), 10 pages. Talk: 13th International Conference on Human-Computer Interaction with Mobile Devices and Services (MobileHCI 2011), Stockholm, Schweden; 08-30-2011 - 09-02-2011; in: "Proceedings of the 13th International Conference on Human Computer Interaction with Mobile Devices and Services", ACM, New York (2011), ISBN: 978-1-4503-0541-9; 1 - 4. Poster: International Meeting on Emerging Diseases and Surveillance 2011, Wien; 02-04-2011 - 02-07-2011; in: "International Meeting on Emerging Diseases and Surveillance 2011 Book of Abstracts", (2011), 159 - 160. Poster: International Meeting on Emerging Diseases and Surveillance 2011, Wien; 02-04-2011 - 02-07-2011; in: "International Meeting on Emerging Diseases and Surveillance 2011 Book of Abstracts", (2011), 83. Talk: Advances in polymer science and technology 2011, Linz, A; 09-28-2011 - 09-30-2011; in: "Book of Abstracts", (2011). Poster: International Meeting on Emerging Diseases and Surveillance 2011, Wien; 02-04-2011 - 02-07-2011; in: "International Meeting on Emerging Diseases and Surveillance 2011 Book of Abstracts", (2011), 176. Talk: International Conference on Computer Systems and Technologies (CompSysTech 2011), Vienna, Austria; 06-16-2011 - 06-17-2011; in: "Proceedings of the 12th International Conference on Computer Systems and Technologies", (2011), ISBN: 978-1-4503-0917-2; 546 - 551. Poster: 19th Annual Meeting of the BioEnvironmental Polymer Society (BEPS), Wien; 09-28-2011 - 09-30-2011; in: "19th Annual Meeting of the BioEnvironmental Polymer Society", (2011), ISBN: 978-3-9502992-3-6; 32. Poster: 19th Annual Meeting of the BioEnvironmental Polymer Society (BEPS), Wien; 09-28-2011 - 09-30-2011; in: "19th Annual Meeting of the BioEnvironmental Polymer Society", (2011), ISBN: 978-3-9502992-3-6; 40. Talk: The 2011 International Symposium on Collaborative Technologies and Systems, Philadelphia, USA; 05-23-2011 - 05-27-2011; in: "Proceedings of the 2011 International Symposium on Collaborative Technologies and Systems", (2011), 598 - 605. Talk: 22nd International DAAAM Symposium: "Intelligent Manufactoring and Symposium: Power of Knowledge and Creativity", Vienna, Austria; 11-23-2011 - 11-26-2011; in: "Proc. of the 22nd International DAAAM Symposium: "Intelligent Manufactoring and Automation: Power of Knowledge and Creativity"", DAAAM International, Volume 22, No. 1 (2011), ISBN: 978-3-901509-83-4; 1145 - 1146. Talk: Human-Computer Interaction - INTERACT 2011, Lissabon, PT; 09-05-2011 - 09-09-2011; in: "Proceedings of 13th IFIP TC13 Conference on Human-Computer Interaction (INTERACT ´11)", P. Campos et al. (ed. ); Springer Berlin / Heidelberg, Part III (2011), 373 - 390. Poster: 2011 Annual Conference on Human Factors in Computing Systems (CHI'2011), Vancouver, Canada; 05-07-2011 - 05-12-2011; in: "CHI ´11 Extended Abstracts", ACM Press, New York (2011), ISBN: 978-1-4503-0228-9; 1459 - 1464. Talk: Third International Conference on eHealth, Telemedicine, and Social Medicine (eTELEMED 2011), Gosier, Guadeloupe, France; 02-23-2011 - 02-28-2011; in: "Proceedings of the Third International Conference on eHealth, Telemedicine, and Social Medicine", IARIA, (2011), ISBN: 978-1-61208-119-9; 169 - 174. Talk: 8th Workshop on Self-Organizing Maps (WSOM'11), Helsinki; 06-13-2011 - 06-15-2011; in: "Proceedings of the 8th Workshop on Self-Organizing Maps (WSOM'11)", Springer Berlin Heidelberg, LNCS 6731 (2011), ISBN: 9783642215650; 357 - 366. Talk: 10th Mexican International Conference on Artificial Intelligence (MICAI), Puebla, Mexico; 11-26-2011 - 12-04-2011; in: "Advances in Artificial Intelligence - 10th Mexican International Conference on Artificial Intelligence (MICAI)", I. Batyrshin, G. Sidorov (ed. ); Springer, LNAI 7094 (2011), ISBN: 978-3-642-25323-2; 1 - 15. Talk: 12th International Society for Music Information Retrieval Conference (ISMIR 2012), Miami; 10-24-2011 - 10-28-2011; in: "Proceedings of the 12th International Society for Music Information Retrieval Conference (ISMIR 2012)", University of Miami, (2011), ISBN: 978-0-615-54865-4; 675 - 680.